If I scan a restaurant menu and see anything, I mean anything, that has a brown butter sauce poured over it then I stop right there and close the menu — I know what I’ll be ordering. What is brown butter? 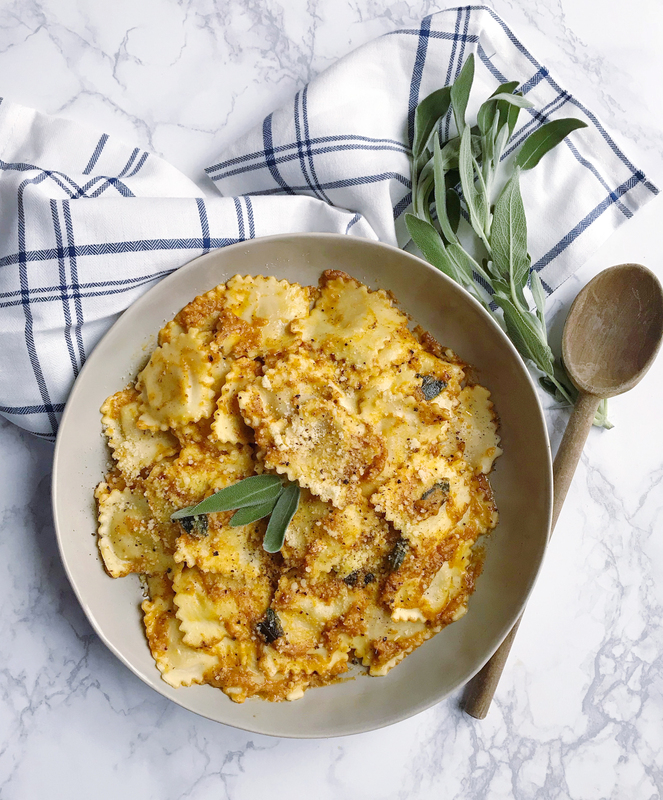 Essentially it’s just butter that is cooked over medium-high heat until browned and foamy, which brings out the sweet and savory flavors and tastes delicious drizzled over pasta and seafood and steak. 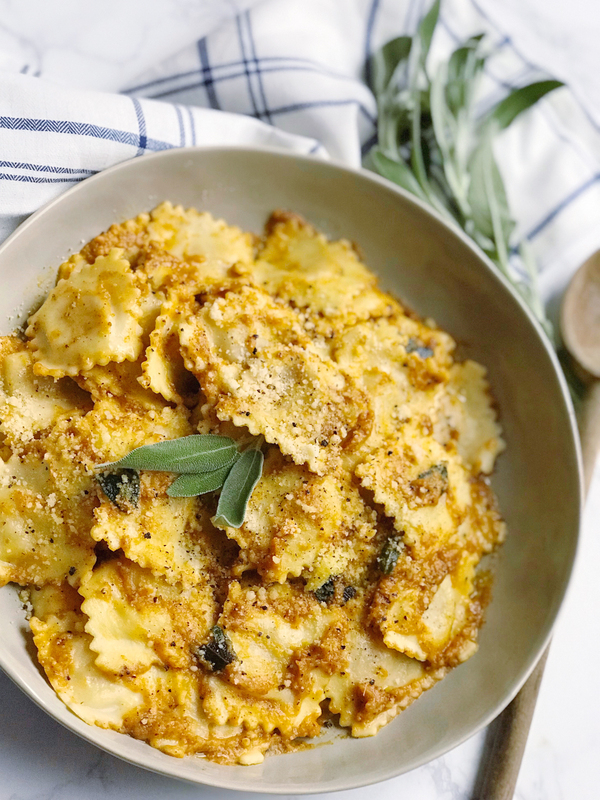 I decided to take this tasty technique and give it an autumnal spin for an easy weeknight dinner: Brown Butter Pumpkin Ravioli. 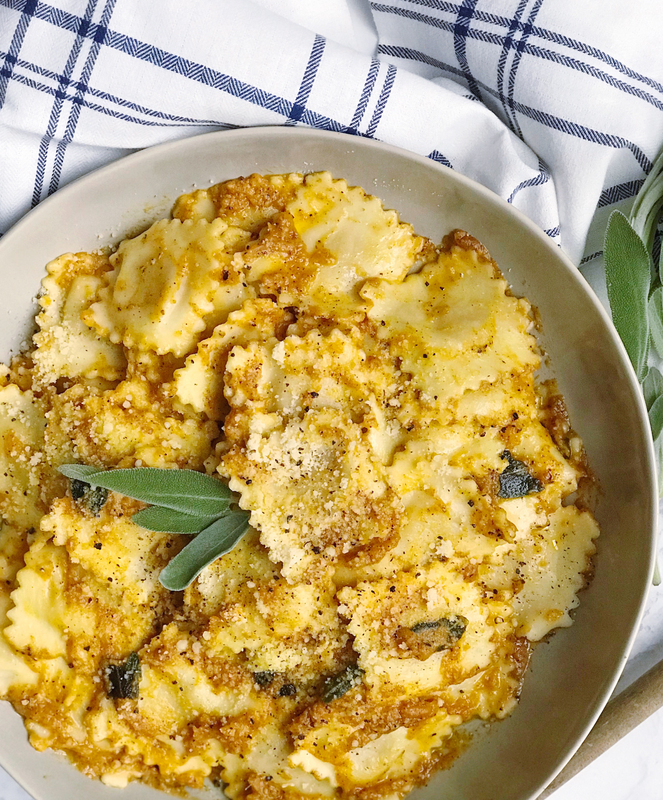 If you look at my Pinterest boards, you’ll see that I’ve been dreaming of pumpkin-flavored dishes, savory sage spices, and any cheese-stuffed pastas I can find. This sauce was inspired by those flavors, starting with that rich brown butter and cooked down sage leaves. I mixed in brown sugar and nutmeg for sweet and nutty balance, and whisked in a bit of pumpkin puree for that seasonal flavoring. A bit of chicken stock and reserved pasta water loosened up the sauce and helped it stick to al dente ravioli (fresh is best if you can get it!). In a sauce pan, melt butter with sage leaves over medium heat and cook until butter browns and begins to foam. Add brown sugar, nutmeg, and pumpkin puree to butter mixture and stir to combine. Whisk in chicken broth and reserved pasta water to loosen sauce and cook. 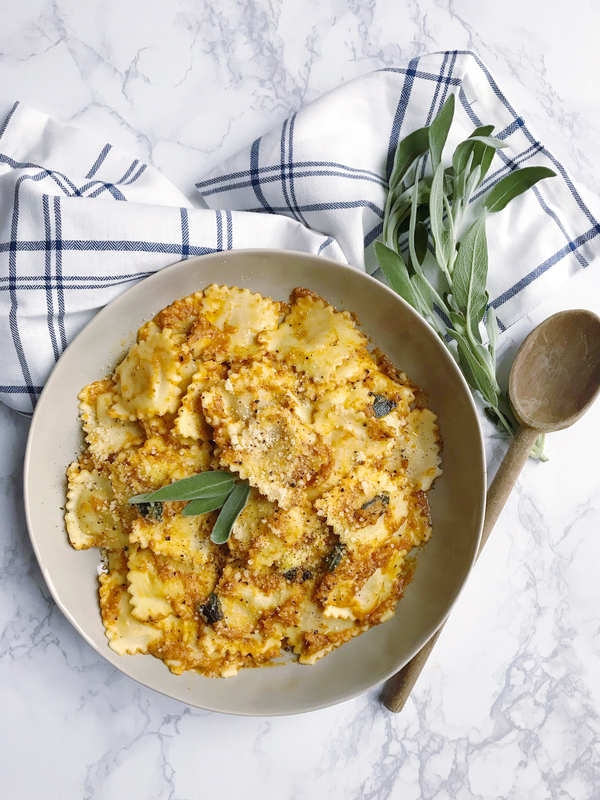 Toss in al dente ravioli and coat pasta with the sauce; finish tossing with parmesan cheese and fresh cracked black pepper. Loaded Halloween Crispy Marshmallow Treats. A Halloween Hot Beverage Bar.